Rats and mice could be costing you a small fortune in feed and they increase the risk of a poultry house fire. Jess Campbell, Dennis Brothers, Jeremiah Davis, Jim Donald and Gene Simpson of the National Poultry Technology Center at Auburn University offer their tips on effective rodent control. Do not allow rodents to ruin your investment! Poultry farms are excellent places for rodents not only to survive but to thrive – unless you are taking the necessary precautions to prevent them from calling your farm home. Poultry houses are warm in the winter, cool in the summer, provide plenty of food and water, have almost unlimited places to hide, and on some farms, have virtually no predators. That is, unless you are on top of your rodent control programme. If you cannot remember the last time you restocked your bait stations and you have been seeing signs of rodents lately, you might be surprised to find out just how many have infested your farm. If you see just one rodent during the day there are likely hundreds and possibly thousands more living on your farm, eating up feed and causing damage. You might have a much bigger problem than you realised and it is time to focus on your rodent control programme. Rodents can easily contaminate feed and water with urine and faeces. They carry diseases such as salmonellosis, colibacillosis, coryza, pasteurellosis, mycoplasmosis, haemorrhagic enteritis, hymenolepiasis, capilariasi, and ascaridiasis. Because of their ability to harbour many pathogens, rodents also can carry over disease organisms from one flock to the next flock, even if the facilities are vigorously cleaned and disinfected. Rodent control should be a part of the disinfection programme to eliminate disease carry-over. A single rat can eat as much as 40 pounds of feed a year. That is the equivalent feed consumed by four five-pound broilers in one flock. Some experts say that for every rodent you see there are likely 50 or more that you do not see. So, if one rat eats 40 pounds of feed a year, then his colony is eating at least 2,000 pounds of chicken feed every year (at $300 per ton). Are rodents eating away at your flock feed conversion and income? Rats eat breeder eggs too! The upper incisor teeth of rodents continue to grow throughout their life and they must continually chew to keep their teeth from becoming too long, so they chew on poultry houses and equipment such as lumber, insulation, electrical and control wiring, ceiling material, curtains, and rubber tunnel door seals. They may be living in your generator shed and chewing on the actual generator or transfer switch. Rodents have been known to cause fires by chewing on electrical wires, and can do serious damage to generators and transfer switches putting your farm at risk of a catastrophic electrical failure. Rodent infestations are not always apparent until we find the obvious signs of damage to the houses or equipment on the farm. There are literally hundreds of places they can hide from us. 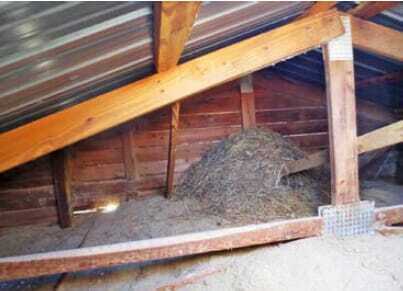 They may have a nest in the attic of a house like the one in the picture below. They can burrow in the dirt pads, litter, and any small crevice and go unseen. Much of the damage that is done by rodents is done at night when we are away from the farm, the lights are off, and the birds are not active. Are rodents working behind the scenes and on third shift on your poultry farm? The authors were not brave enough to find out the species or population in this large rodent colony in a poultry house attic. The main rodent entry way is to the left (sun shining through hole), and the main den is to the right. 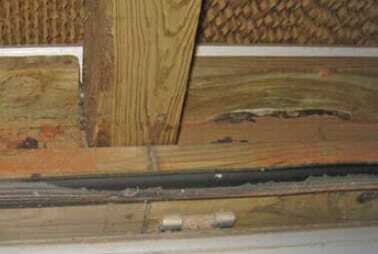 Don’t underestimate the importance of inspecting attics and protecting them with poison. Photo above shows the bottom seal on a tunnel door on a house less than a year old. The rodents have damaged approximately 40 per cent of the bottom seal. Also notice there is no bird wire over tunnel inlet opening. That leaves one less obstacle for rodents (or birds) to worry about when they want to enter. Rodents become sexually mature around two to three months of age with a gestation period of between 21 and 25 days. A single female may produce as many as 70 offspring that mature and colonise in a year. A single pair of rodents can infiltrate a poultry farm and establish a vast colony quickly and without being noticed. If you see one it is likely you are not dealing with just one mouse but an entire colony or more! Rodents have strength in numbers! 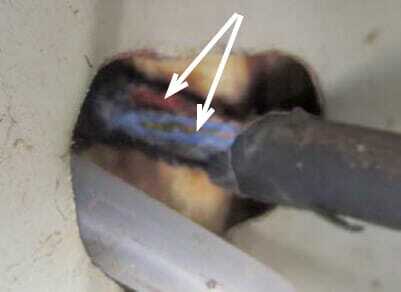 This thermal image reveals multiple rodent tunnels inside a solid insulated wall that are otherwise invisible. The exterior metal on the outside of the wall was not fastened tightly at the top or bottom. The cold spot at the top of the wall is the top entry point, allowing the rodents into the attic and the lower dark spots to the right show entry points from the ground. This is a perfect harbour for rodents. Insulation was found along the outside of this wall where rodents were entering and leaving. Step 1: Eradicate (kill) all possible existing rodents. Step 2: Keep any others from visiting or moving in – or staying alive if they do come in. Identify the rodents on your farm. Mice leave behind rice-sized faeces and rats are closer to the size of a bean. Know your enemy and consult your company service technician or local equipment supplier for advice on helping you pick the right bait stations, traps and poison to do the job right. Install one bait station close to each corner of the generator shed and one under the generator. Install bait stations a maximum of every 100 feet along exterior perimeter of all poultry houses. Some experts may suggest more frequent spacing of 80 feet. Install approximately two bait stations inside every evaporative cooling plenum room (dog house). Install two bait stations in every control room. Install one additional bait station around feed bins. Install one bait station on both sides of every end wall door. Loose rodent meal or block bait should be thrown into the attic from each attic access hole in both directions to increase baited area. For houses that have a concrete or lumber ledge on the interior wall of the house, one bait station every 100-feet along the interior of the house may also be necessary. All bait stations must be cleaned out thoroughly every year by pressure washing. All bait stations must be serviced and restocked with new bait of an alternating active ingredient at least every four months. All cobwebs must be removed with a stiff bristle paint brush. Watch out for black widow spiders in stations so use gloves for your safety and to keep from contaminating bait and stations with human scent. The diagram below shows some possible locations to consider installing bait stations if you do not already have a successful programme. Once all possible rodents have been eradicated from the farm and there are no signs of rodent life, the next step is to do everything possible to keep other rodents from coming in. The first step is to make sure the farm is kept as clean as possible. This includes eliminating brush and garbage piles, keeping garbage cans clean and having lids, keeping spilled feed cleaned up, keeping water from standing around houses, and keeping the grass cut short between and around all houses. Rodent control pertains to incinerator sheds, hay barns, bird freezer sheds and other offices or buildings that are in close proximity to poultry houses. Control rooms should be kept clean and orderly and generator sheds should not have supplies piled up on the floor, especially around the generator. Realistically, the steps outlined above will minimise the number of rodents coming onto your farm and getting into your houses but you cannot keep them all away. That is why Step 9 in your rodent control programme is so important. Even when you know you have eradicated all your previous tenants, you must keep the programme going by regularly cleaning and restocking bait stations. This is an ongoing and extremely important step that must not be taken lightly, especially if other poultry farms are in close proximity. Routinely monitoring and maintaining all rodent bait stations, meal baits and traps is the only way to successfully keep rodents from establishing a home on your farm and damaging your equipment. At least four times a year, all houses must be inspected for possible places where rodents could or have entered the houses. Mice can gain access through and around evaporative cooling systems, damaged exterior metal, corrugations in metal, around doors, through curtains, through fans, through vents, around the eaves, through plumbing entrances, through feed auger entrances and any number of other places. Mice can fit through a hole the size of a dime and rats through a quarter-size hole. On some farms, it may be impossible to fill all the holes, so you may have to be more aggressive with bait stations. Think safety first! Regardless of the manufacturer of meal baits, soft baits or stations, make sure you read and understand all instructions and directions before installing stations and poisons. The instructions are there to help you succeed, so take the time to do some homework and do it right the first time. The last thing you want to do is to harm a child, yourself or a pet companion, so think safety first. Considering that a colony of only 100 or so rats will eat 4,000 or more pounds of feed a year, think of what a serious rodent infestation can do to your flock feed conversion and your income. The feed problem alone makes rodent control worth taking very seriously. Generator, transfer switch, controller and alarm component repair or replacement costs are measured in thousands of dollars. Total loss of an entire flock due to equipment damage could cost $10,000 in a small house, not including the associated equipment repairs and flock disposal costs. Damage resulting in the total loss of an entire poultry house from rodent damage causing a fire would be the replacement cost of the house. This varies but is estimated at about $225,000 for the average 40×500 broiler or pullet house or $300,000 for a breeder hen house. Don’t let rodents catch you off guard! Maintain a strict rodent control programme.